JOURNEY guitarist Neal Schon will embark on his “Journey Through Time” tour next month. 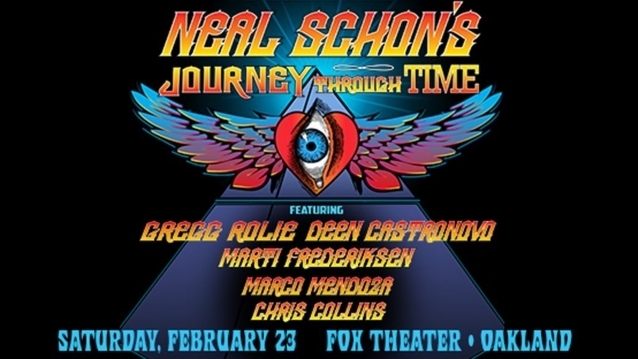 Schon will take the stage alongside founding JOURNEY and SANTANA singer/keyboardist Gregg Rolie, ex-JOURNEY drummer Deen Castronovo, bassist Marco Mendoza of THE DEAD DAISIES and THIN LIZZY, a musician named Chris Collins (on guitar and keyboards) and super-producer Marti Frederiksen (multi-instrumentalist, vocals). The band will play a warm-up show on February 22 at the Jackson Rancheria Casino in Jackson, California before the trek’s official kick-off on February 23 at the Fox Theater in Oakland, California. “Journey Through Time” will hit the road in February 2019 for the first time, celebrating JOURNEY‘s legendary catalog and rich history. Returning to their roots, the band will showcase songs from the very beginning — plus pay tribute to your favorite classic hits.